The facts of this matter are not yet clear, but the behaviour of both parties appears to have been extremely ill-judged. 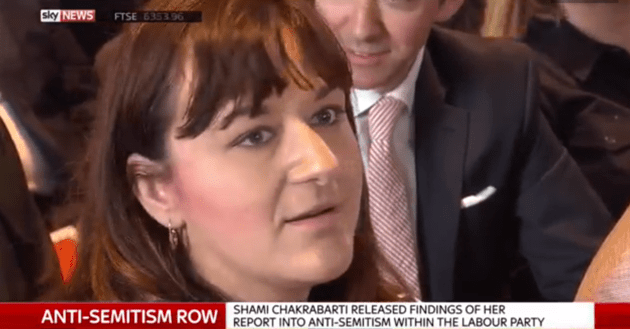 It seems the launch of Shami Chakrabarti’s report into alleged anti-Semitism in the Labour party was marred by a row between a member of pro-Jeremy Corbyn group Momentum and Labour MP Ruth Smeeth who, it appears, is Jewish. This Writer would not have known that, prior to today’s events. It isn’t on any publicity material I have seen for Ms Smeeth and, to be perfectly honest, it’s none of my business what religion she chooses to follow, if any. Even her presence at an event about anti-Semitism is no indication. I am not Jewish myself but the focus on this issue, before the local elections in May, means it is likely I would have wanted to attend this event, had I been located a little nearer to it. So I have a doubt when I see Ms Smeeth saying Momentum activist Marc Wadsworth subjected her to “anti-Semitic” abuse. Is it anti-Semitic to make a connection between a newspaper and an MP when a representative of one is seen working with another? I would suggest that the answer is no. From the Huffington Post‘s story, it seems Mr Wadsworth had been handing out press releases from Momentum containing some incendiary language. I haven’t seen it so I cannot confirm the allegation that it said MPs trying to unseat Mr Corbyn were “traitors”. It seems a Telegraph columnist had handed a copy of this press release to Ms Smeeth, in order to get a reaction that could be used in a future newspaper report, and this is what prompted Mr Wadsworth to make his remark. Is that an anti-Semitic remark? I would argue that it isn’t. In any case, Ms Smeeth’s subsequent outburst against Jeremy Corbyn is completely out-of-order. She claimed the Labour leader “stood by” and did “absolutely nothing” during the incident. Did he even know anything had happened until she got up and walked out? The video clip does not show him anywhere near these events. Yet she has taken this apparent lack of interest as an opportunity to demand Mr Corbyn’s resignation, saying “a Labour Party under his stewardship cannot be a safe space for British Jews” and that the party needed “someone with the backbone to confront racism and anti-Semitism in our party and in the country”. The accusation is bizarre because not only was the inquiry a direct result of action by Mr Corbyn to address possible anti-Semitism and racism in the Labour Party, but the party was in the process of receiving a mostly clean bill of health as she stormed out of the meeting. Jeremy Corbyn should resign because Labour is not a “safe space for British Jews” with him as leader, a Jewish Labour MP has said. Ruth Smeeth this morning left a Labour anti-Semitism event after being accused by a Momentum activist of working “hand-in-hand” with the media to damage Corbyn. The Stoke-on-Trent North MP said in a statement this afternoon Corbyn had “stood by” and done “absolutely nothing” as she was subjected to “anti-Semitic slurs”. “People like this have no place in our party or our movement and must be opposed. Until today I had made no public comment about Jeremy’s ability to lead our party, but the fact that he failed to intervene is final proof for me that he is unfit to lead, and that a Labour Party under his stewardship cannot be a safe space for British Jews,” she said. Mr Corbyn himself came under attack for his own comments, which critics rather desperately tried to twist into a comparison between the state of Israel and the terrorists of Daesh, sometimes called Islamic State. In his speech, he said: “To assume that a Jewish friend or fellow member is wealthy, some kind of financial or media conspiracy, or takes a particular position on politics in general or on Israel and on Palestine in particular, is just wrong. Look at the words. He was making a distinction between two different things – not a comparison between, as it happens, two different things. Much has been made of claims that criticism of the state of Israel is equivalent to anti-Semitism. Mr Corbyn was making it clear that these claims carry no weight and the political actions of the government in Israel may not be linked with Jewish people in general – in exactly the same way that Muslims may not be linked with organisations we associate with terrorism, just because they (nominally) share a religion. The relevant comparison isn’t between Israel and Daesh/Islamic State, but between Jews and Israel, or between Muslims and Daesh/Islamic State. I apologise for making a meal of this but it is important to make the distinctions clear before going on to say that the claim of Sam Stopp, a Labour councillor in Brent, north-west London, who tweeted, “@jeremycorbyn has compared Israel to ISIS today. For that alone, he should resign. I am red with fury #Corbyn”, is codswallop. This Writer is left with the impression that Jeremy Corbyn’s opponents within the Labour Party have been reduced to manufacturing uncomfortable and false slurs against him – perhaps to make up for the lack of any substantial evidence of wrong-doing or incompetence? Oh dear, looks like some people will go to any lengths to tar Corbyn! I always thought that the term ‘Semetic’ applied to the Arabs, Aramenians, Jews, Carthaginians, Ethiopians, Abyssinians and Phoenicians. It is ‘interesting’ that the definition of this word has been hi-jacked to mean that it only applies to the Jewish ‘race’ and more particularly, the state of Israel. No, NOT the state of Israel. My reason for making the statement that I did came about after my recalling part of a conversation that I had with a friend who stated that he was an Ashkenazi Jew. believe in the existence of some supernatural being. ( De Cive/ Leviathan ) Which, more or less, is my own opinion on the subject. We were chatting about the difference in attitude between Zionist and Semetic Jewry at the time when he introduced the possibility of the Israeli State’s culpability in regards to the state of play with the states that border Israel. This took me aback, mainly because I hadn’t even considered the possibility before. He then introduced me, by powerful argument backed up by logic ad reason, that there exists members of the Jewry that are anti-Semetic and others that are anti-Zionists. He has the capacity to presenti a powerful and convincing argument on most topics but especially those involving politics. Hmm. I think we’d need to see these arguments laid out in full before passing any judgement on them – and this political blog probably isn’t the place. I wouldn’t mind passing on any appropriate weblinks, though. Oh Dear, I must be anti-Semitic myself. I just left a similar claim of treachery. But like you am struggling to find a link between a worthless bunch of ‘elite’ MP’s who have proved themselves untrustworthy at a time of upheaval for our country and those who are of Jewish persuasion – I struggle to find any religion viable with all the hate in the world, if you do I don’t care what you call him or her! For some reason I’ve never got my head around the thought a single person represents an entire nation, a wee bit oversimplified for my liking! There are lots of people, of all creeds, colours, cultures, religions and none, who are the “serially offended.” On the basis of what has been published, we are possibly witnessing exactly that. That’s very useful – thanks.